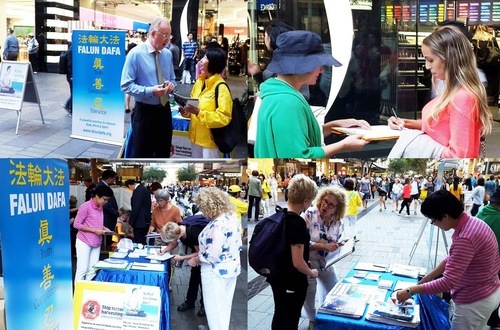 Practitioners demonstrated the Falun Gong exercises on Pitt Street, the busiest street in Sydney, Australia, on the afternoon of March 31, 2016 to raise awareness of the persecution of Falun Gong in China and call on Australian people to urge Prime Minister Malcolm Turnbull to ask the Chinese president to stop the persecution during his upcoming visit to China on April 14 and 15. 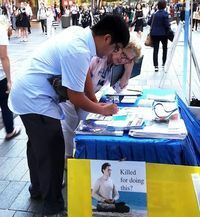 Passersby pause to learn about the persecution of Falun Gong and sign postcards to the Prime Minister, calling on him to help stop the persecution in China. The street was filled with crowds. Many people stopped to learn about the persecution or watch the practitioners’ exercise demonstration. 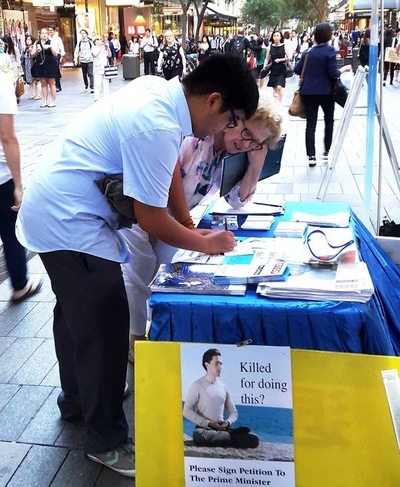 They were shocked to learn that practitioners doing the same meditation practice in China are detained, imprisoned, or even killed for their organs. Isuzu Dortch asked a practitioner after learning about the persecution, “What can I do to help stop the persecution?” A practitioner told her to sign a postcard to express her wish that Prime Minister would urge the current Chinese leader to stop the persecution immediately and bring the perpetrators to justice. She filled in the postcard right away after placing her shopping bag aside. Maria Dawelln and her boyfriend Adam passed by the venue and signed the postcards after learning about the persecution. Adam said, “Hearing of the persecution, I am shocked. 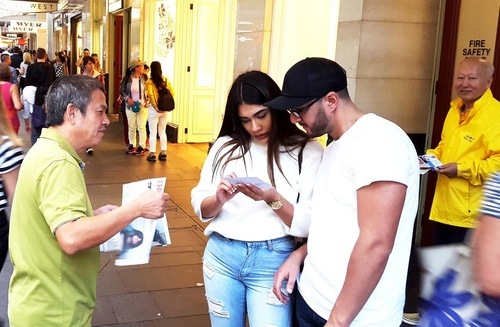 Have you placed the information about the signature collection online to let more people sign?” He said he would do more to help stop the persecution. He also indicated that he would watch the documentary film Human Harvest: China’s Organ Trafficking broadcast by SBS Dateline TV, and ask his friends to see it as well. Maria said that more people would join the effort against the persecution. She wishes that Falun Gong practitioners in China can freely practice. Maria Dawelln and her boyfriend Adam sign postcards after learning of the persecution in China. Christopti Mendoza signs a postcard to the Prime Minister.